Erin Gilbert was a respected professor until her belief in the supernatural costs [sic] her her job, sending her back to the realm of paranormal research. Although Ghostbusters is a gender-swapped reboot, it's not a direct copy. For instance, Erin Gilbert would seem to be this movie's Venkman - a trained scientist, but not as gung-ho as Ray - but unlike Venkman, she's not a charlatan looking to score with undergrads. She has short hair, rather than the ponytail she wore in the film. Having learned their lesson from the boys, this time the Minimates have removable proton packs from the start; and yes, they're the new design. And now we move from Kristen Wiig, the woman who carried SNL for years, to Kate McKinnon, the woman who started carrying it after. A brilliant and unconventional engineer, Holtzman is the technical wizard behind all of the Ghostbusters ghost-trapping equipment. 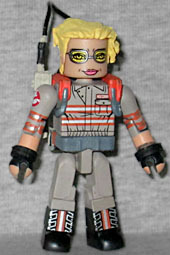 Jillian Holtzman is clearly the group's Egon, right down to the big goofy blonde hair (though that's more of an animated thing, really). She's wearing her goggles, but they're just painted on; shame AA couldn't pull a Jubilee (or a Janine) and mold them as part of the hair, but then they probably couldn't be clear. Her sleeves are rolled up, but the skin on her arms is more orange than the skin on her face. Also, while it's nice that we get removable proton packs (and proton streams) what are we supposed to do about Holtzman's proton pistols? 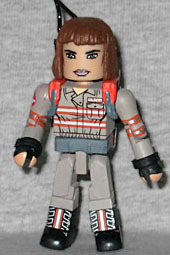 This entry was posted in Art Asylum, MMMR and tagged Ghostbusters, Minimates. Bookmark the permalink.